Don’t you believe the U.S. is not behind this, but Al-Qaeda is moving into Syria in large numbers. This is because the American-led NATO offensive to dislodge our president has failed miserably. In fact, news coming into SyrPer indicates that many deserters have been trying to negotiate terms for coming back to their homeland. Apparently, however, Generals Fahd Al-Fureij and Ali Ayoub, Defense Minister and Chief of Staff respectively, have resisted any such deals. Yet, it is becoming clear that what SyrPer told you was accurate. Riad Al-As’ad, the titular head of the FSA, is now relegated to raising chrysanthemums and muttering idiotic chants. His movement has failed and now the stakes, the ante and the pot are much more important than his motley crowd of deserters and retired generals. But, Obama’s mistake is now putrefacting in the light of day. Aleppo is almost completely under Syrian army control. Do not believe a word in the Western press. My source in Aleppo, Wael, who speaks regularly to Syrian officers there confirms what SyrPer has been telling you. According to Wael’s officer friends in the 4th Mechanized Armored Division, over 1,500 terrorists have been killed in fighting in that city. Reinforcements have not been coming in because the city is completely sealed. With ammunition always scarce and communication with the outside precarious, the terrorists have been trying to merge with the population in an effort to escape. It’s not working. Aleppans are sick of the terrorism and call security whenever anything suspicious is going on. All Libyans, according to Wael, have been killed. He also told me that morale among Syrian rebels is way down because they were not given a warm reception by the population and are now awake to the reality of foreign Islamist terrorists merging and, in some case, coopting their movement. In certain quarters of Aleppo, civilians opened fire on terrorists with hunting rifles and souvenir pistols. it’s going to end here. We disagree with Nazir, also that, the crisis will be over by November. Also, near Der’ah, there are some clashes with terrorists, but nothing threatening. People are beginning to realize they were duped by the “opposition”. 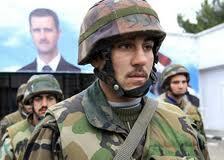 Syrian soldiers, fully aware of the foreign Jihadist threat, are tired but indomitable. They have killed over 1,500 terrorists in Aleppo. But there is much work to be done. We must congratulate General Rustom Ghazali, new Chief of Policital Security (Al-Amn Al-Siyasi), for his excellent work in clearing the Damascus countryside of the terrorist vermin. His unparalleled ruthlessness is ideally suited for the kind of warfare these murderers from Saudi Arabia and Qatar prosecute. His record in Lebanon was not so laudable only because of his style. His methods are, however, very effective. 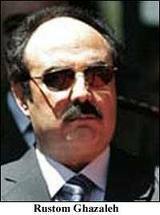 Once the heir to General Ghazi Kan’aan, head of Military Intelligence in Lebanon, he was withdrawn and given the post of MI Chief for the Damascus Countryside. After the July explosion that killed four of our best generals, he was appointed to take the place of General Ali Mamlouk.